A History article about the future seems a bit of an odd idea but we thought it might be 'fun’! This article is the last of three speeches given at the start of the Society's 250th Anniversary Appeal (about four years ago). At the time it was intended to publish a number of articles in a celebration copy of Res Medica. 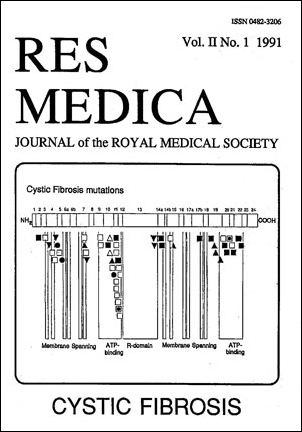 Sadly publication was hampered by financial constraints and Res Medica ‘slept on’ until our first issue last year which featured an historical account of the RMS. This article is about the personal predictions of the future of the RMS by Dr. Richard Newton. He was a senior president of the Society and is currently working as a psychiatrist at the Royal Edinburgh Hospital. How on earth does one talk about the future of the Royal Medical Society? During these celebrations, however, it is appropriate to wonder what the future might have in store for us and indeed to wonder whether we will still be here in another 250 years time. To picture the future one really needs to study the past and the present, and I am thankful that this has already been done by the two preceding speakers. It seems to me that the Royal Medical Society stands and has stood for two different things: at any time in the future these two parts of the Society will continue to be important. That is, its historical standpoint and present standpoint.